I’ll get to that in a moment. Did you have a good weekend? I spent it with Bern Ina, a lovely older Swiss gentleman with impeccable manners. He helped me finish my Go Four It quilt – picture coming soon – and the Snapshots Block No. 1. For those who asked about the pattern for the black-and-orange four-patch quilt, the pattern is in the April 2015 issue of American Patchwork & Quilting magazine, available now through the end of March at a quilt shop, book shop or grocery store near you. There are three very different four-patch quilts from ModaLissa, April Rosenthal and Edyta Sitar. Mine is a variation of April’s Buried Treasure quilt – it’s the same block in a different setting. This will be a busy week with QuiltCon starting on Thursday. Moda folks will start heading to Austin this afternoon and a few will be staying through Sunday afternoon. I’m excited about going and seeing the sights, quilts, people and vendors. (It’s a quilt show so there has to be shopping, right?) Did I tell you that I’d signed up for some classes last Summer? I’ll let you know what I learn. No. I will not be getting a tattoo. It isn’t that I think I’m too old for that sort of thing, it’s that I know it isn’t “me”. But apparently I am old… “old faithful”. Okay, so the comment was in the context of patterns and how “I” – Miss Rosie’s Quilt Co. – was like “old faithful” in that many of the older patterns were still sought-out by quilt shops and quilters. (P.S. Thank you!) Still. With the advent of PDF. 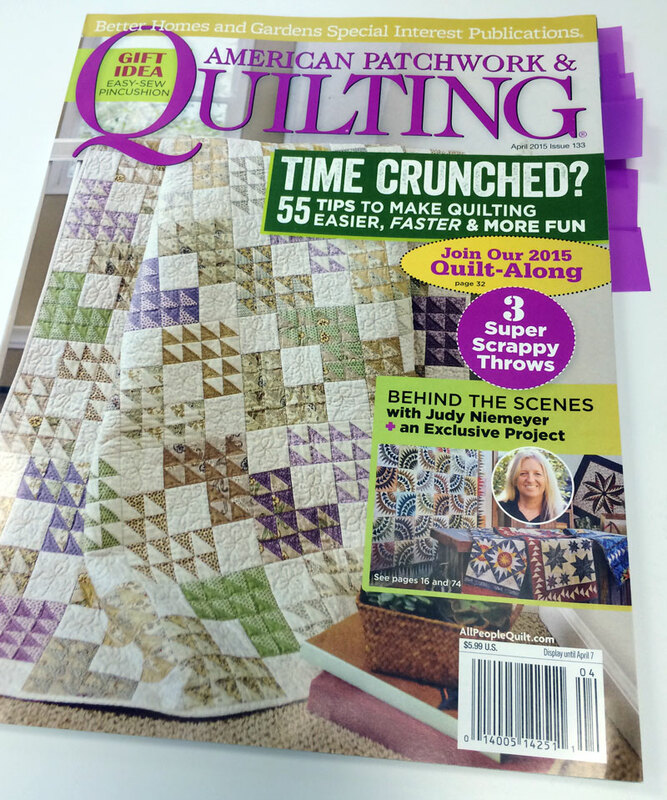 patterns, online shopping, and social media, there is no question that the quilt pattern business has changed since I started writing patterns in 2002. The “shelf-life” is still relatively short – less than a year – and many come-and-go pretty quickly. Timing can play a huge role in how well a pattern does, and the level of difficulty generally has very little to do with it. Dear Jane and the Farmer’s Wife quilts continue to be popular, but in the fourteen years since Terry Atkinson published Yellow Brick Road, it hasn’t been out of the Top Ten Patterns sold by distributors. I’m often asked if I look at, buy, read and use other people’s patterns. Of course I do! I’m a quilter and I buy patterns because I love the quilt and I cling to the notion that I’ll someday be able to make every one of them! I’ve even made several… though I will own up to sometimes often usually changing one or two teeny, tiny things. So what are the most popular patterns right now? Bags. Lots of bag patterns – the Weekender Travel Bag by Amy Butler and the Beatle Bags by Abbey Lane top the list, followed by a couple of bag patterns by Terry Atkinson. Do you make bags? I enjoy it but I’d rather make a quilt. Like one of these “best selling” patterns – I have a couple of these patterns. Row 1 – Atkinson Designs Yellow Brick Road / Basic Grey’s Mesmerize / Bunny Hill Designs’ Merry, Merry Snowmen. Row 2 – Bunny Hill’s I Believe in Snowmen / the stack of everything I pulled in the warehouse / Bunny Hills’ Christmas Wheels. 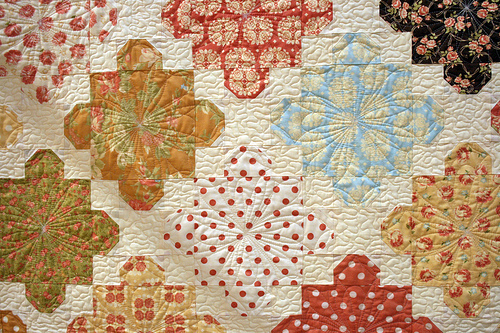 Row 3 – Crab-Apple Hill’s Gingerbread Square / Jaybird Quilts’ Toes in the Sand / Thimbleblossoms’ Swoon. Do you have any favorite patterns? (Bonus points to anyone who mentions one by Miss Rosie’s Quilt Co.) I probably have every pattern published by Sandy Klop of American Jane, and most of those from Jen Kingwell. Steam Punk has been on my “to do” list for almost two years. But when I’m asked if I have a pattern that I love, once that I would consider as an “old faithful”, you-can’t-go-wrong=with-this-pattern… Vanilla & Blooms by Fig Tree & Company – Joanna Figueroa. I. Love. This. Quilt / Pattern. It’s out-of-print as a paper pattern but still available as a PDF download. Both versions are terrific and I can’t think of any pattern that shows off gorgeous fabric better than this one. It looks good in every style of fabric. Especially Fig Tree fabric. The other one is Swoom by Thimbleblossoms – Miss Roskelley. Even though I’ve seen what seems like a thousand versions of Camille’s quilt, I’ve yet to see a single one that wasn’t spectacular. Not one. “Old Faithful”. It’s much prettier than it sounds. I love waking up and finding a new post from you, Carrie! It’s a great way to start the day! I have both Vanilla Blooms and Swoon (haven’t made either but they are definitely on my list, in several fabric ways! One of my favorite patterns is Tag Sale (by Miss Rosie’s Quilt Co!) It is on my bed right now and I love it. It is a great pattern for any quilter, beginner or experienced. I need to make another one in a different colorway! Have fun at Quilt Con! Love your posts ! I have always wanted to make the Yellow Brick Road, its a pretty pattern, and it looks so simple, but for some reason I never get to it. There is always something that needs to get done first. I also iike the Grey pattern, its different, it would be great for my grandsons bedroom. Greetings from New Braunfels. Great post! I saw some of my favorites in your line up. Will definitely have to check out your pattern in the magazine. My library carries it. Looking forward to QuiltCon. Enjoy your post, as always – thank you! It’s nice to hear about the way styles in quilting change too! I love most of those patterns (and have lots of them and yours too ) you mentioned, but never noticed Fig Tree’s before… it’s very pretty and thanks for the info about purchasing a pdf. I do like the “real” patterns better, but this still works too. I have a very long to-do list – better get cracking! I love Esch house basic math quilt pattern. It uses a layer cake and is every bit as easy as yellow brick road. It’s quick and easy and I usually add extra fabric to make it bigger. It was a Free pattern in Moda bake shop. Another Old Faithful is Turning Twenty. I love Terry Atkinson’s patterns and Camille’s. I enjoyed your post and I hope you have fun at QuiltCon. Enjoy your Quilt Con experience, I saw the class list and would love to be there taking some. And, of course, taking a detour to explore Austin’s food cart culture!!!!! I agree patterns are good and sometimes bad, but the oness you love to make over and over or never forget that you made is the one that sticks. I was lucky enough to get your Fruit Salad pattern before you closed up shop for the move and I am so glad. It was just a joy to make. I always look for Ms Rosie mini patterns since they wodk so well with pre-cuts. I have been hoarding Decoy so I can make one of every color , the perfect size to put on my dining room table for each season of the year… Thanks for reminding me of all the great ones. I loved the honesty in your writings today. I enjoy designing my own patterns as much as I enjoy making another designers. Admitting it has to be spectacular in my eye for me to do this. Swoon by Camille Roskelley is my most recent finished. Still collecting for an old favorite of yours Cracked Pots. Lol. Wishing you a spectacular time at QuiltCon. My two favs, Terry Atkinson and Thimbleblossoms, made your list 🙂 Looking forward to updates from Quilt Con! Yellow Brick Road was the first quilt I ever made. It is my go-to for something quick. I have also made a Swoon quilt. I am going to have to try and find the Fig Tree quilt pattern. I like Joanna’s patterns too! I have a boat-load of your patterns and a couple of books as well! What I love about your patterns is hearing your voice in your writing. I also feel like you add a lot of helpful tips. Another thing that sets patterns apart, besides the artistry of the design, is the quality of the directions. A poorly written pattern, even for a simple design, can be a frustrating experience. Conversely, making a difficult design is a special joy when the pattern includes well-written instructions that add to a quilter’s skill set. Another fan of your patterns, “Decoy” and “Amadeus” here. I’ve got several more stacks of fabric lined up to make more of your quilts as well. As for an “Old Faithful” pattern, i usually turn to one called “Butter Charm and Jelly” by Legacy Patterns. It’s very easy, very adaptable where size is concerned, looks good in any style fabric, scrap happy, and loves the pre-cuts as well. I don#t have a ‘to-go’-pattern because I love to always try something new. The only pattern I’ve made three times yet was one I designed myself and yes, of course, I still need to make one for myself because I gave the three away. My favorite designers are you (you know I love you, don’t you? ), Camille and Joanne, because each and every pattern is truely amazing and I learned a lot from the three of you! About paper vs PDF: I love PDFs! I can have the pattern in a second and there’s no shipping. Perhaps that’s not so much a factor for you in the USA but if you live outside believe it is. This post was very well-done, thank you. I think some of my favorite quilts have been ones that didn’t even require a pattern. I just like a classic nine patch next to a snowball, for instance, or the sixteen-patch (probably the one I’ve made the most) or some sawtooth stars with sashing. I do buy patterns and I like looking at books but I often find the simple block patterns make the nicest quilts. I spend far more time looking at fabric than patterns, I wonder why that is? Usually the fabric lends itself to one sort of quilt pattern but sometimes a collection or single print will pose a challenge. I LOVE Metropolitan Fair and bought a half-yard bundle (!) but have not found one single pattern I want to make with it! But I know someday one will just hit me and I’ll be cutting it up for that perfect quilt. Thank you again for this blog, you have brought Moda to life for me! Carrie, I feel like I, and a few thousand others, have found a new BFF and sewing buddy. You’re real, Thank you. Very much! Not to mention Moda’s shining star, hands down, all patterns, fabrics, designers included. My favorite thing you do besides the Moda blog! is this- I love the way all the Miss Rosie patterns play and mingle with the fabric.. I lack technical knowledge on this, bear with me. When I see one of your quilts / patterns, the fabric doesn’t scream Beautiful Fabric, and pattern doesn’t blare out either. 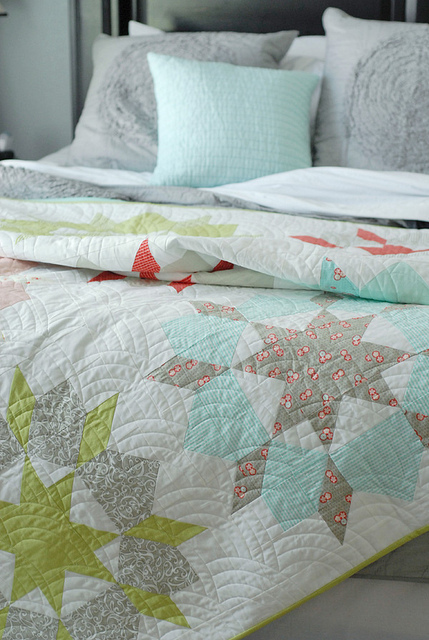 I see a beautifully designed quilt with instant charm & character, Quilt Patina? I wanna sit down and study your artistry, pick out the subtle pattern, and try and guage your fabric selections. Beyond measure, you’re at the top of my list. Other favorites are Jen Clingwell’s beautiful mosaics, and Brenda Riddle, all past (Pathways & Crossroads stands out), all present, and anything future she ever tackles . Can’t wait to get my paws into Ambleside! Not sure I can tackle Dulcette but I can dream! I don’t have the Vanilla & Blooms so now I must look it up, but do have Swoon – haven’t made that one yet. I just finished your Route 44 in my favorite shades of teal, LOVE IT, and just picked up Seven Letters from the quilters this past weekend, it’s ready to bind and it’s BEAUITFUL!! I’m on my second quilt of Basic Grey’s Mesmerize pattern. Made one as a Christmas gift for son/DIL and daughter saw it and now wants one, so I’m working on that now. Love the Chopsticks Pattern from Jaybird quilts. It’s so versatile and quick! Another of my go-tos is Summer Porch from Eleanor Burns. I don’t know if it’s a stand alone though. I got it out of her book. The best thing about you working for Moda is that you post a lot more than you did on your blog and I always totally enjoyed reading those warm, neighborly posts. Super to see that you will still post there occasionally! Of course I’ve got Swoon in my stash, and a few Jaybird patterns, and so many others, I am stocked up for years to come! I particulary like your Schnibbles patterns because I’m still working full time and also spend a LOT of time singing in a phenomenal Sweet Adeline chorus (just down the road apiece from y’all at Moda) and don’t have time to make big quilts… at this time. My favorite Schnibbles is probably Bibelot because it’s a T quilt and I’m a T person! I have a couple of Schnibbles books and several individual patterns; Oso, Hook and Full House, to name a few! Dadgum, I’m torturing myself here with all this quilty talk! Regarding the Tattoo, I’ve never wanted a Tattoo either but I do have a truism to share. Our neighbor’s daughter in spite of her parent’s rules against Tattoo’s sneaked & had one done. It was a simple one with her name on her upper arm. She had shown her brother & told him, “If I die before you make sure you check my arm to make sure it is me. Regretably, Ruby was killed by a “hit & run” driver as she walked home from school. A graduating senior in 3 weeks the town spiraled downward in mourning, Rubye was so involved in everything in her family & the town from Brownies to the nursing home & the school newspaper, & anything else going on. The family gathered at the crematorium awaiting her body to be brought in for the cremation. Suddenly John ran over to the mortuary man & whispered something to him, & the man shook his head NO. John now frantic continued to whisper with a continued NO from the mortuary man. With nothing to lose John told his family of Ruby’s wish, they were shocked & in disbelief ’till 4 yro Mattie said, “I want to see.” This seemed to wake the family & they agreed. The mortuary man asked for a few minutes to make sure everything was alright & then invited the family to view Ruby’s body. The first to view Ruby were John & Mattie, John reached down to lift Mattie & as he raised the sleeve of Ruby’s dress—NO TATTOO. Because there was such trauma it was impossible to identify her from just looking, but there was definitely NO TATTOO. John & Mattie told the man to wait a few mninutes & walked into the funeral home where services were about to be held & YES, they found Ruby, not by facial identification but by the name RUBY on her upper arm. Can you imagine the angst & disbelief? The girl who was to be Ruby was a girl who had been shot in the face by a shotgun as she tried to rob a store, the owner had a shotgun under the counter of his pawn shop & although she shot him twice in the abdomen, he nonetheless saved his life by using the shotgun. The change was quickly made & Ruby was cremated as she had asked & her family eventually had each member’s name TATTOOed on their upper right arm. John told them that a family from Jordan had all their family TATTOOed for this very reason–a simple method of identification & Ruby had always thought of this changing world & thought it important. Although I really do not want a TATTOO, Ruby, my niece “niggles” at me. Id ever seen Vanilla and Blooms before but it’s ion my list now. Swoon is already on there but so are so many others. Do let us know how Quilt Con was and have a fab time! I have almost every Miss Rosie pattern (books too, of course) and I’ve made a lot of them. They’re detailed, accurate, and degree of difficulty is such that they can be very complicated-looking, but not terribly hard to make – a perfect combination. I have the yellow road pattern, but I haven’t made one and probably won’t. I love New York Beauties and I’ve made a couple and will make more. I have some baby quilts to make for my newborn grandson (who will be in our custody – another long story) and another grandson to be born in May. Life is busy, but there must always be time for quilting. I have made Toes in the Sand and love it. I want to make Swoon. I have the craftsy class for that one. I saw one of your Miss Rosie’s Quilt Company’s patterns made up last time I visited AZ – Raise the Roof. I want to make that one. Patterns: Karen Montgomery; “Three, Six, Nine” pattern is a snap to make. I’ve made at least a dozen quilts from this pattern in different sizes. Like YBR, but easier & quicker, and looks good in any fabrics. And your own Schnibbles pattern “Rooibos” makes a quick & fun baby quilt; (I’ve used that several times, too). I make quilts for charities, and find these 2 patterns (plus an occasional nine-patch rendition) get the job done easily. Thanks Carrie, for all the info each week, it is a joy to find your messages! Carrie, thanks for keeping us in the loop with quilting. Getting back to favorites, hands down, I love your Schnibbles Winter White and have made it so many times for Fall and Winter. In fact, I probably need to make a Patriotic one as well! Have fun in Austin; shop tons! Always enjoy reading your posts! I was surprised to see 2 of my projects in your photos of the current best selling patterns. I am currently working on Toes in the Sand with Kate Spain’s beautiful Horizon fabric line and have a second Mesmerize waiting patiently in a project box ready to go. I made the lap size as a Christmas gift and loved it so much that I plan to make a king size version for myself! I also recently ordered your Schnibbles Full House pattern and plan to make it for my son’s downtown apartment. I do like the Vanilla & Blooms pattern you’ve shown – I’ve got some Downton Abbey fat quarters that I’ve been keeping for the perfect quilt pattern and this might be it! I love a basic double Irish Chain as a go to pattern! Lately I have been hooked on Miss Rosie’s schnibbles! I have done Madeline, Jersey Girl, Tickle,Winter White, Sweet Spot,Mon Ami and Nice Day! Just recently I ordered quite a few more, so 2015 will be another schnibbles year for me! George and Clover are next on my list! Thank you, Carrie for my new love!! I must admit I’d seen MANY Yellow Brick Roads and liked them, but was not crazy about the cover photo. I had the pattern several years before one day I decided to make it, THAT’s when I “got it”. The light bulb moment – love when that happens! I have Swoon and have not found time to make it – too many QOV I guess. I have so many Rosie books and patterns though, and they are in one special place – my favorites (especially the Houses!). One of my all-time favourite patterns: True Blue from Spice of Life book. Ages ago, and on request, an American (quilting) friend’s (quilting) sister brought a copy of the book (amongst others) to Australia for me. Coincidentally, she was working on the same quilt (from the single pattern) in blues & whites. We happened upon a shop selling the Lily & Will fabric line & mine was made in lime green & chocolate. I’ve made a many quilts since, but that one is simply special. There’s something comforting about it that always brightens my day. And, not too long ago, you mentioned Bunny Hill designs in your blog – I ordered her Mistletoe Lane kit … and realised Lily & Will is her fabric! Serendipity! I’ve been following you for years – words can’t express how much you have inspired & influenced me in so many (sometimes unexpected) ways. 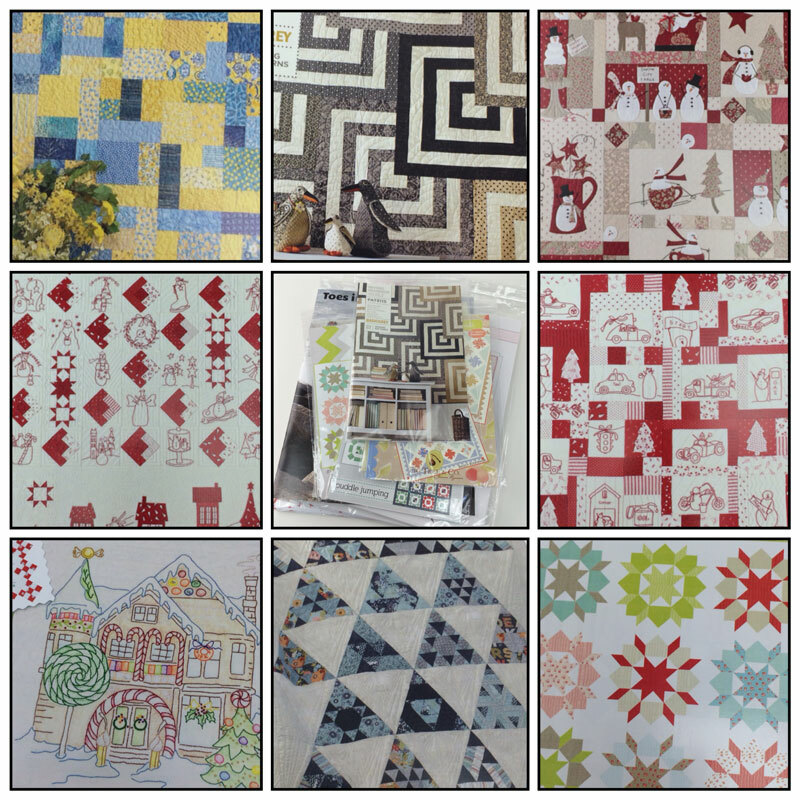 I am addicted to MODA, Love the Swoom quilt. Can you please tell me what fabric line is used.